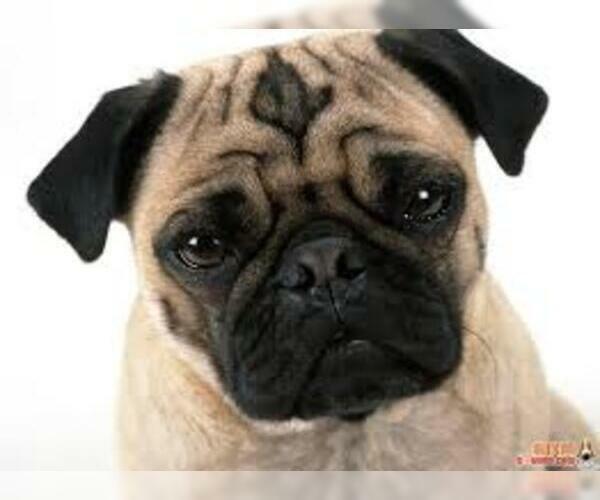 Overview: The Pug is one of the oldest breeds of dogs and has flourished since before 400 BC. 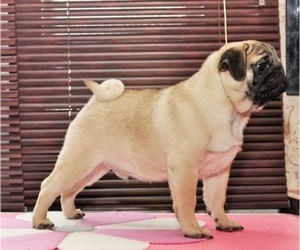 China is the earliest known source for Pugs, where they were pets of the Buddhist monasteries in Tibet. The Pug is a family favorite. Full of confidence and always eager to please, this dog makes a great playmate for children and a loyal addition to the family. Colors: Silver, apricot-fawn, or black, with black muzzle or mask, ears, cheek moles, and trace down back. 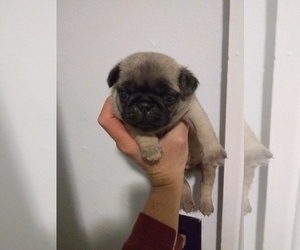 Character: Pugs are social and very easy-going. Known for their intelligence, these dogs are generally calm and reserved. Temperament: This breed gets along well with children, other dogs, and most household pets. They may become jealous if their owner diverts attention to another animal or child. Care: The Pug requires occasional grooming with a rubber brush to remove loose hairs. Special lotion can be used on the facial creases to clean and nourish the skin. Training: Since Pugs are stubborn, independent and smart enough to get bored quickly with repetitive exercises, they are not always easy to train. With their silly, distracting antics added to the mix, training a Pug may seem downright impossible at times. Thankfully, Pugs are exceptionally eager to please their owners, and owners who are consistent and patient can usually train their Pugs to exhibit the desired response to his or her prompts. Heaping praise upon them can also help tremendously, since they thrive on attention from their owners. It is also very important that owners do not inadvertently praise behaviors that, while cute, are not the point of the training exercise. This breed is very fond of food and treats, so using treats as rewards may provide some additional motivation for dogs that are especially strong-willed. Working with Pugs during the first six months of their lives is crucial where training is concerned, as it is much more difficult to change dogs’ behaviors after this point. 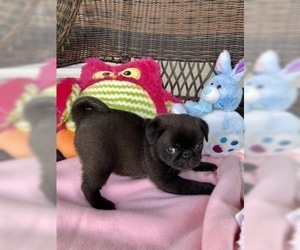 Some owners express concern about how long it takes to house-train Pugs, but puppies of this breed do not develop the muscle strength to control their bowels and bladder completely until they are around 6 months old. As with other commands and skills, Pugs learn to house-train with plenty of positive reinforcement in the form of treats and praise. This breed requires gentle training, as they are very sensitive to the tone of the trainer's voice. Activity: Pugs love to romp and play outdoors on a regular basis. Due to their small size and rather lazy nature, Pugs do not require a lot of physical activity to stay healthy and in-shape. A daily walk around the neighborhood or a romp in the backyard should easily meet these dogs’ exercise requirements; in fact, too much exercise can exacerbate Pugs’ tendency to wheeze. 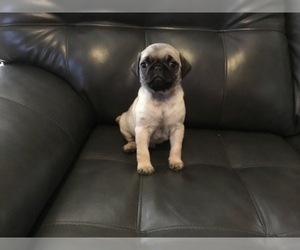 While Pugs do love to play, especially with children, it is important to prevent them from jumping off high surfaces like sofas or other furniture, since doing so can cause joint damage. 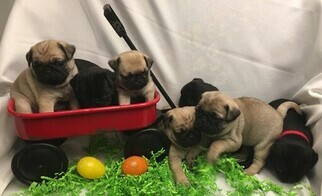 Since they do not require much exercise, Pugs make great companions for those who live in apartments or homes without large backyards, including the elderly. Health Issue: This breed tends to catch colds easily and is stressed by weather extremes. They may be prone to allergies, breathing problems, and skin problems. All black male pug 3 months old comes with all belongs food bowls collar and more.